I know you are wondering how one can be almost completely correct and totally wrong simultaneously. Before I explain that, can someone explain to me how the referees can call offsetting procedure and encroachment penalties? More on the referees later. This morning I published an article entitled Game Day…our prediction. In that article, I predicted Kentucky would go 2-0 in the games to be played at Fortera Stadium on the campus of APSU. 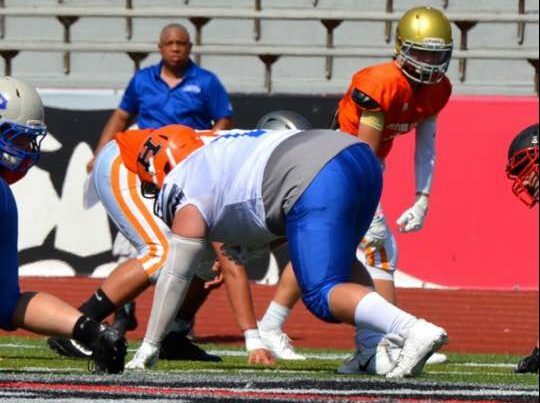 Well, I was close to right as Tennessee held off Kentucky 21-20 in the seventh grade game and lost 17-14 to Kentucky in the 8th grade game. As the games were so close, I was 2 points from being completely correct and finishing 2-0, but I was only 4 points from going 0-2 and looking like an idiot homer (which would be accurate as that is what I am). Under those circumstances, I will skate out of Fortera 1-1, counting myself lucky…or unlucky…hell, I’m confused. In the seventh grade game, I thought Preston Agee and Isaac MacNamee had very good moments and drove the team down across the goal line at crucial times. I thought Agee’s engineered drives came at slightly more critical times and that is why I would give him the edge in the contest over MacNamee as to whom played the better game. Now, on Kentucky’s return for a TD which made the score 21-20 at the end of the game, the excessive celebration penalty on the kid, which eliminated the standard PAT attempt and forced a try from around the 20, was an unfortunate call. The kid’s celebration was good natured and wasn’t so upstaging as to warrant the officials deciding the game instead of letting the kids decide it. That’s my opinion, and I am entitled to it. Still, in a game in which Tennessee has never lost, and one in which Kentucky has rarely even competed, the fact Kentucky should have won this game indicates the talent, in the much more sparsely populated Commonwealth, is getting better and the gap between the football talent in the two neighbors is lessening. I do want to say one thing to the young men who got the unsportsmanlike penalties and especially the young man who body slammed the Tennessee player on the track, you know who you are, I am not going to out you here. Keep your composure. You have no business negatively impacting the team’s chances of victory because your mad. You have to learn to keep your composure. We had three unnecessary penalties in one drive during a critical part of the 2nd half in a back and forth ballgame. There’s no place for that in football. You’re better than that. 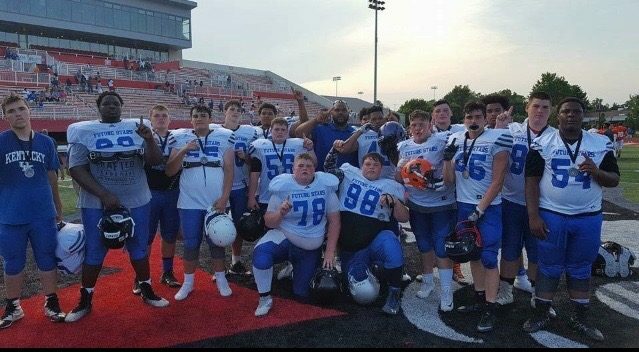 Now in the 8th grade game, I can’t say enough about the gritty play of Kentucky who played solid defense, particularly up front, and especially in applying pressure to the QBs. Every QB Tennessee had, except for Javin Burke from Cleveland (who wasn’t a threat to throw it anyway) was running for his life back there most the game. A special kudo to Isiah Forrest from Hopkinsville, Kentucky who worked most the day against a Damen Owens at WR who is slated to start at Brentwood Academy this Fall as a freshman and who is one of the most coveted WR prospects in the 2021 class. Forrest took him out of the game and Owens was never a factor. I don’t think the kid caught a ball and was targeted 5 or 6 times. If Justice Thompson doesn’t take over the game in the 4th quarter from LB, Forrest is probably the defensive MVP. However, Thompson was all over the field and an easy choice for the distinction. 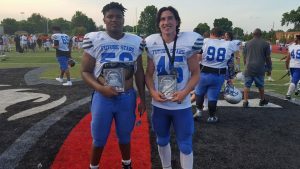 With the game on the line and needing to drive down the field to win, trailing 14-10 with almost 7 minutes remaining, Kentucky decided to give 6’0″ 200 pound RB Austin Gough from Owensboro the ball. Gough, for his part, decided to bowl over every defender Tennessee had and downright plow about four defenders at the goal line to take it across for victory. I have always said Gough is a downhill, manster (half man, half monster, sorry I have borrowed your nickname Randy White) of a back, but the 4th quarter was ridiculous. It was crunch time and Gough crunched them indeed. Kudos should go to the bigs up front too as no RB is an island, if you don’t believe it, ask him. Gough won the Offensive MVP of the game, and deservedly, because, when we needed him most, he took matters into his own hands and won the game for Kentucky. That’s an MVP in my book. I have to say two players who stood out to me for Tennessee were Orlandis Williamson from Milan, Tennessee on Offense and Toleo Malone from Nashville, Tennessee on Defense. I didn’t see Toleo much down the stretch when we were Goughing it down their throats (pun intended). Anyone cheering on Kentucky had to have been grateful Tennessee benched him, though, for my part, I must confess confusion as to why. Malone killed us when he was in there, making numerous plays behind the line of scrimmage. Both Malone and William Long, who are like brothers, were game captains for his respective team. That indicates what the coaching staff thought of the players’ efforts during the week leading up to the game. It was a beautiful moment watching them hug each other at mid-field prior to kick-off at the coin toss…really nice moment. As William’s father and someone who loves Toleo as well, that was a nice pre-Father’s Day present which I immensely enjoyed. Kentucky’s other Captains were EJ Austin, LaVell Wright and Justice Thompson. EJ Austin didn’t play in the second half and I hear it had to do with the medical staff’s concern he had been concussed. That same medical staff evaluated him, determined he was fine, but forgot to transmit its findings to the Kentucky coaches until the game was nearly finished. When EJ Austin was in the game, though, he was electric. EJ found Eli Blakey from the State Champion Newburg Middle on a perfectly executed, back-shoulder throw down the sideline in the early part of the game for an important flip of field position and also had a long run on a Keeper up the middle to keep an important first half drive alive. Cummings managed the game well and threw it effectively, but EJ Austin gave Kentucky play-making ability Cummings lacks with his feet which, situationally, could have helped Kentucky in the second half. Oh well, we won and that’s the important thing. Congratulations to Coach Farmer and his staff for preparing the team well and installing a game plan that was executed well, especially considering the team’s short time together. Honestly, both teams played better than you would expect a couple of teams to play who are relative strangers having practiced only a few times. I thought that fact was apparent in the kicking game. For Kentucky, I have to mention Ben Schofield, Kentucky’s place kicker. Schofield got an opportunity to kick a field goal to give Kentucky a 10-7 lead courtesy of William Long and Nick Coates. Long rocketed off Tennessee’s Left Tackle’s outside eye and forced, then recovered, a fumble which set up Kentucky in Tennessee territory. Then, Nick Coates, caught a key 3rd and long deep out which was well covered. Coates reception didn’t get Kentucky a fresh set of downs, but did get the ball in field goal range, which is all The Schofield Leg Cannon would need. Ben Schofield, the young kicker from Paducah, came in, with the game tied in the second half, out of a bad snap but brilliant placement by the holder whose number I didn’t catch, and drilled a 32 yard field goal right through the uprights under a furious Tennessee rush for what proved to be the winning margin. If the game had stopped right there, and Austin Gough had not had to put the team on his shoulders and drive us down the field into the end zone to retake a three point lead to which Schofield had before staked us, Schofield might well have been the Offensive MVP. He converted both PATs and an unbelievable field goal with a holder to whom he wasn’t accustomed and a snapper probably doing it for his first time in game action. Remarkable! A tip of the hat has to go to Ricco Hughes for his putting the teams together. Kentucky had a great day competing but losing narrowly one game and gritting out an impressive victory in the other. As I said above, we were two points from 2-0 and 4 points from 0-2. Similar to what Charles Dickens would write in A Tale of Two Cities, the two games played today seemed like…It was the best of times, it was the worst of times, it was the age of wisdom, it was the age of foolishness, it was the epoch of belief, it was the epoch of incredulity, it was the season of Light, it was the season of Darkness, it was the spring of hope, it was the winter of despair, we had everything before us, we had nothing before us, we were all going direct to Heaven, we were all going direct the other way – in short, the period was so far like the present period, that some of its noisiest authorities insisted on its being received, for good or for evil, in the superlative degree of comparison only. Yeah ballers, that about sums up the day well enough for me. One thing is for sure, Kentucky today…PLAYED THROUGH THE WHISTLE!